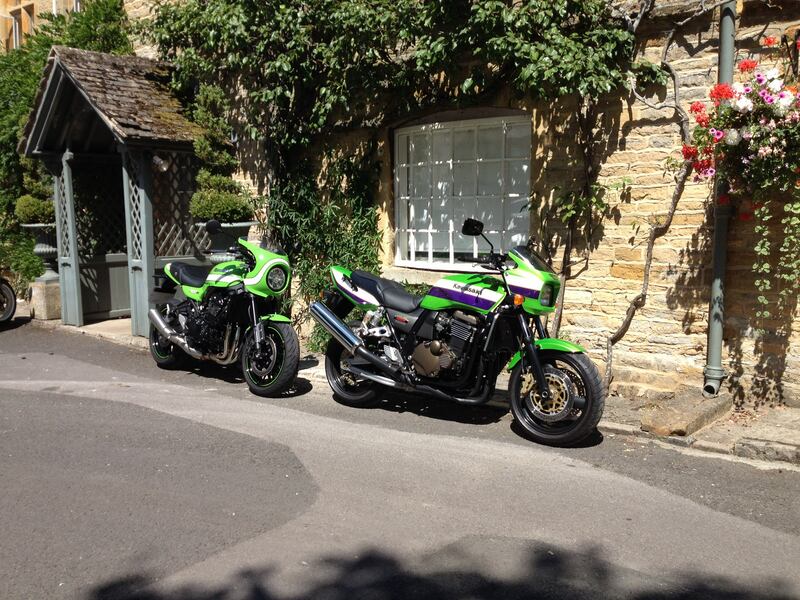 Thought it might be of interest to see my brother's new Cafe Racer up against a REX. What do people reckon ?? Not quite sure the new RS is quite as butch/macho as the Rex, but overall in the real world the new bike will murder the ZRX! It certainly ain’t cheap, and the finish/paint is the ducks guts! I would have preferred some candy / metallic in the 900 paint. The later ZRX went to solid colours and this has continued the trend. The 900 is wearing a factory option 2 person seat - not the standard jobby. Note how short the front fender is - even with an extender it is barely along as the Rex one - which has caused a few stone chips on the rad. Think it is probably more nimble than a rex though. I am keen to see where Kawa take the RS and Café versions in season 2 onwards. Hodna added spoked wheels and 4 into 2 pipes plus different tank shape - so I am hopeful this could follow on here. Methinks the CafeRS is harking back to the 70s/80sTeam Green colours, and yes it’s considerably more nimble than a Rex, with superior suspension and brakes to boot, bit down on horses, ZRX will have top speed advantage above 140+. But the RS is a good bit lighter, especially when the chrome breadbox exhaust is skipped! Performance and speed is largely irrelevant seeing we dont ride on the track all the time and going much above the limits gets you banned in short order. The RS is just fugly, it is neither one thing nor another. It is a cheap motorcycle at circa £10K but that shows in the styling and bits used in the build. A mint Rex can be bought for half the price and looks way better. It'll hold it's value better too (not that I care personally one way or the other). The Rex IS fast becoming a classic, the RS and it's siblings are just wannabe's with little identity of their own. They are neither classic nor innovative nor even attractive. That headlight and the indicators on the 900 look like they came from a Chinese 125. The Jap boys have lost the plot. My brother is getting some round after market winkers for it soon. I will try and get a pic or two. I’d love to see a ‘mint’ Rex for £4-5k, perhaps mr Perton will sell me his for that amount? You must have a large bank account too, if ya reckon £10-£11k is a cheap bike! 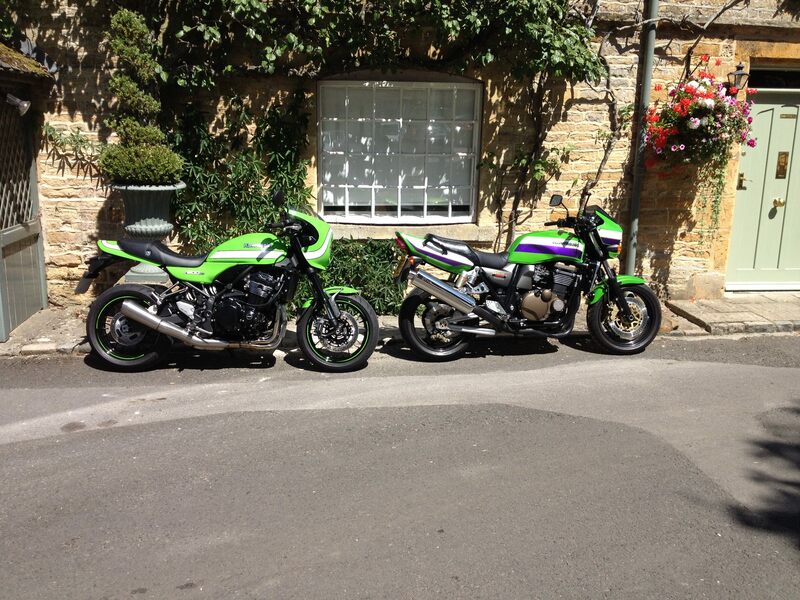 There's a comparison test in August's Pratical Sportbikes between a 1983 Z1000R, a 2000 ZRX1100 and the 2018 Z900RS Cafe jobbie - I know which one I'd sooner own.